Q What is AmnioGuard®/UCGuard™ and what are the indications? A AmnioGuard/UCGuard is a thicker version of cryopreserved AmnioGraft® processed from the umbilical cord. AmnioGuard/UCGuard is 300-400 microns thick, versus 50-100 microns for AmnioGraft. AmnioGuard is indicated for use as a patch graft to cover an extraocular aqueous shunt. Q What CPT code is used to report application of a patch graft over a glaucoma drainage device (GDD)? A Application of a graft is not reported separately. Use 66180 (aqueous shunt to extraocular equatorial plate reservoir, external approach; with graft) to report this placement of an aqueous shunt with a patch graft. Formerly, 67255 was used for the patch graft portion of the procedure, but that is no longer applicable. Q May AmnioGuard be used in re-operations? A Yes. Extraocular aqueous shunts may need revision (CPT 66185) with another patch graft. This may occur inside or outside the postoperative period of the primary surgery (CPT 66180). Inside the global period, a claim for reimbursement requires a modifier, usually modifier 78 (return to the OR for a related procedure). As with the original implantation of the GDD, 67255 was formerly used for the patch graft portion of the procedure, but that is no longer applicable. Q What is the Medicare reimbursement for 66180 and 66185? A Physician payment rates vary by the site of service. 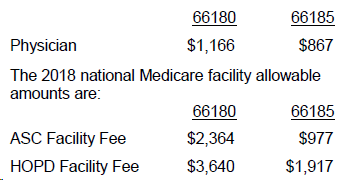 The 2018 Medicare Physician Medicare Physician Fee Schedule allowable amounts are as follows. There is no differential when the procedure is performed in-office as opposed to in a facility. Medicare generally expects these procedures to be performed in a facility. These amounts are adjusted by local wage indices in each area. Other payers set their own fee schedules, which may differ considerably from Medicare rates. Q Is there separate reimbursement for the tissue? A Not for Medicare. HCPCS code V2790, Amniotic membrane for surgical reconstruction per procedure, is no longer eligible for discrete Medicare payment in any setting; reimbursement for the supply is included with payment for the procedure. Other payers may not follow CMS’ approach; check with the payer.